Most of us know Bromeliads as plants from tropical rainforests with tough foliage and showy flowers that are grown as houseplants. Occasionally you will find their ostentatious flowers in bouquets from glitzy florists. So not the sort of plant, then, that springs to mind when trying to bring exoticism into the garden, and certainly not at this time of year. There is, though, one member of the family that not only makes a startling garden plant but also comes into its own late in the year. Originating from the coastal forests of Chile, Fascicularia bicolor is probably the only bromeliad that can be grown easily in British gardens. 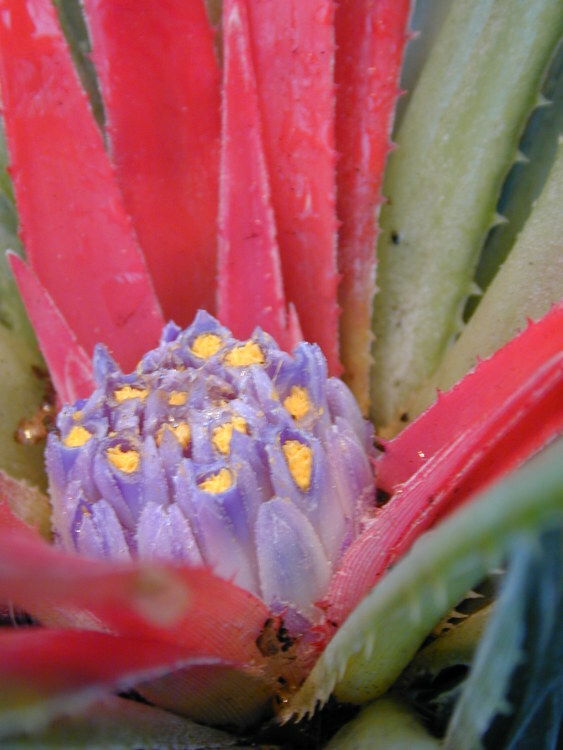 Most bromeliads are epiphytic, that is they grow on other plants without being parasitic on them, but Fascicularia are terrestrial, living on the forest floor. To protect themselves from grazing animals they have evolved tough, hard-to-chew foliage, usually with spines. Not even llamas are tempted by them. The leaves of Fascicularia bicolor are characteristic of the genus: long, thin, and leathery with soft spines. The leaves form rosettes which, as the plant grows, clump with other rosettes to make an impressive mound. The Latin fascicularia literally means ‘clustered together in bundles’ and is an accurate description of the plant. Typically a deep olive green, the foliage acquires a silvery sheen with age and for its first two years is content to bulk up and look unpromising. Then, towards the end of summer, the bases of the leaves begin stealthily to turn red. At first no more than a dark smudge in the heart of the rosette, after a few weeks most of the leaf becomes bright crimson. The whole effect is startlingly beautiful, but is not the end of the display. On mature plants a bud forms in the centre of the rosette that opens into a pale blue flower. The improbable combination of blue flower against bright red and dark green foliage would be outlandish at any time of year; surrounded by the sombre tones of autumn it is an even more astonishing sight. In the wild the plant has leaves up to one metre long but in British gardens they rarely get to more than 30 centimetres. At Tresco Abbey Gardens in the Scily Isles you will see very large plants that are so happy with the climate and growing conditions that they almost form ground cover. London gardeners, too, can grow large, carpeting plants, but this is the result of specific climatic conditions, and most of us have to content ourselves with much smaller plants. But even the smallest plant will provide a nostalgic reminder of the colours of high summer. Good drainage is essential, so dig lots of grit into the soil or grow in a raised bed. Don’t be tempted to enrich your soil as this will encourage lots of leaves and few flowers. After flowering the rosettes begin to die but new ones quickly form from the base. Pull away the dead foliage to prevent disease spreading from the rotting leaves. Mine grow very well in a partly-shaded bed but they are best in full sun. In the 1950’s the RHS advised that Fascicularia was a plant that could only be grown in the warmer, southern counties of England. Perhaps because of changing climatic conditions, it can now be successfully grown throughout Britain. I have seen healthy specimens thriving in South Yorkshire. It will withstand temperatures down to at least –10oC as long as it is in not in wet soil. If you live in a very wet area, consider growing it in a large pot and keeping it in a cold greenhouse during the winter. Fasicularia look best when grown with other hardy tropical plants which have the same cultivation needs. The hardy agaves, Agave parryi and Agave schidigera, echo the domed shape of Fascicularia . The taller Yuccas, such as Yucca filamentosa, prove a good background to Fasicularia. If you grow them in pots group them together with other exotic-looking plants such as Aeoniums, Aloes and Echiveras. I know someone who grows their Fascicularia bicolor in pots in a cold greenhouse and brings them into the house over Christmas where their bright colouring adds to the gaiety of the season.